This versatile set of three heart-shaped earrings offers multiple symmetric or asymmetric styling options. The earrings shine in feminine rose gold-plated metal. Two are embellished with clear crystal pavé, while the other one features red crystal pavé. 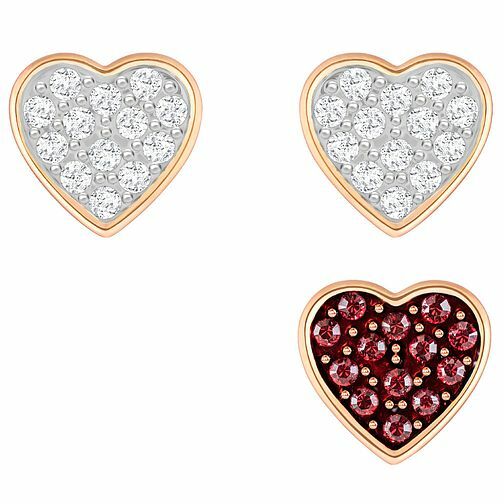 Swarovski Crystal Wishes Rose Gold Plated Heart Earrings is rated 3.0 out of 5 by 1. Rated 3 out of 5 by Anonymous from Pretty earrings These earrings were a Christmas gift for my daughter who was delighted with them. They certainly are pretty and sparkly. The lower star marking is for the fact that the earrings went down by £20 right after Christmas. It's always a risk that purchases will go into a sale, but it's very annoying and takes away the pleasure of gifting.